The most powerful banker in Spain has been ordered to stand trial charged with misappropriation of bank funds. Emilio Botin, chairman of Santander Central Hispano, Spain's largest bank, has also been accused of irresponsible management. In a separate case, he will have to defend allegations that he helped clients to evade taxes. Two former colleagues, Jose Maria Amusategui and Angel Corcostegui, are also accused of misappropriating funds. 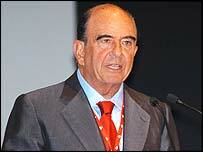 One of the richest men in Spain, Mr Botin is a scion of the Spanish banking world - his family has been running Banco Santander since 1857. After he took control from his father 18 years ago, Mr Botin built Santander into the 13th largest banking group in the world - with huge influence in Latin America as well as Europe. In 1994 Santander acquired Banesto and merged with Banco Central Hispano in 1999. In August 2001, Mr Amusategui and Mr Corcostegui stood down after an acrimonious power struggle, leaving Mr Botin as the manager of the merged corporation. An agreement, reached in private, resulted in the two former employees receiving 56 million euros ($66m) and 108 million euros ($128m) respectively. A shareholder accused the men of receiving too much money, which was not justified under the corporate laws of the bank. The bank's board of governors are standing behind Mr Botin, who has boosted the assets of the bank to 350bn euros ($416bn) through various mergers and the bank has enjoyed 15 consecutive years of profits. "He is one of the personalities of Spain's economic life and having him in the dock is rather surprising," said Professor Pedro Schwarz, chief economist for brokers Fincorp in Madrid. Mr Botin is a large shareholder in the bank, but the traditional patriarchal practice of running a company in the manner he chose has become less popular in Spain. "What he saw fit was very good for the bank until now," Professor Schwarz said, "and people respect him." The bank itself has denied all charges levelled at Mr Botin, pointing out that the shareholder who instigated the charges, Mr Perez Escolar, was himself jailed for four years for fraud although he served only one month because of ill health. In a statement to the BBC World Service, the bank said: "This Order has been issued despite the Public Prosecutor having requested the dismissal and shelving of the charges, on the basis of the finding that they do not constitute any crime whatsoever, and that the payments effected are entirely in accordance with the law." "Emilio Botin is a scion of a long family of bankers."